Police have 'substantially reduced' their list of potential persons of interest. The foster family of William Tyrrell have marked the third anniversary of his disappearance with a vow to never stop looking for him, as police announce they have substantially narrowed the field of potential suspects in their first public comments on the case in a year. William was three years old when he disappeared without a trace from his grandmother's yard at her home on Benaroon Drive, Kendall, on September 12, 2014. He would have turned six years old in June. The boy's foster family still maintains hope he will be found, and renewed a national appeal for for information on William's whereabouts. 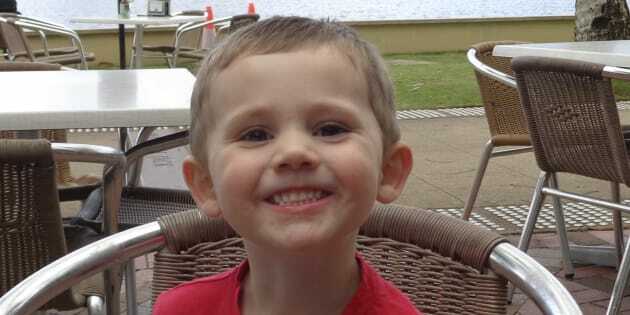 William Tyrell, pictured here when he was three, went missing on September 12, 2014. "Where are you William? Where are you our precious little boy? Tomorrow will mark the third anniversary of your abduction and three tragic years of unspeakable heartbreak and endless tears," the boy's foster family said in a statement on the Where's William Facebook page. William, we will never stop loving you. "We will never stop looking for you, and until the tomorrow we yearn for comes, we will never give up hope that you will be found and returned home to the arms of your loved ones where you belong." In late August it was revealed William was in foster care when he vanished, after the Department of Family and Community Services lost its bid for a permanent injunction to stop an advocacy group from publishing the information. Making the decision to allow William's foster care to be publicly known, NSW Supreme Court of NSW judge Justice Paul Brereton raised "the tragic probability that [William] is no longer alive". Within a few short hours of William's disappearance three years ago hundreds of local residents and emergency service workers searched the rural township for the boy -- combing forests, creeks and paddocks for the boy. Detectives and analysts from the State Crime Command's Homicide Squad established Strike Force Rosann to investigate the circumstances surrounding William's disappearance, while a $1 million reward was announced for information that leads to his recovery. Strike Force Rosann, who with NSW investigators make up one of the largest investigations ever undertaken by the NSW Police Force, have interviewed hundreds of persons of interest and collected thousands of pieces of evidence. But investigators are still looking for answers, said Detective Chief Inspector Gary Jubelin, who on Tuesday spoke publicly on the case for the first time in a year. "The last 12 months hasn't been any easier than previous years -- we are frustrated that after three years we are not where we want to be -- but we are still determined to find out what happened to young William," said lead investigator, Detective Chief Inspector Gary Jubelin. He said police had "substantially reduced" their list of potential persons of interest, but said new persons of interest will be added when they come into police sights. He also urged common sense when reporting to police. Thanking the community for its support, Jubelin said police do not want to chase up reports of three-year-olds running around dressed as Spiderman. "All our investigative efforts need to go into pursuing information that leads us to William. What we really want is to hear from those who know what happened in that yard on 12 September 2014." he said. "We are interested in speaking to people who suspect someone they know may have information specifically related to his disappearance. "And I'll remind the public that NSW Police Force does not seek help from psychics, mediums and clairvoyants."